Do I really need to point this out? Look at the previous pictures posted. OMF wrote: Symbolically, this could be right on the money. Shinji, alone of all the pilots, is coerced into piloting. The seatbelt could represent his obligations to pilot that bind gim to his role. At some point this is true. But not every pilot is coerced into piloting. Asuka WANTS to pilot the Eva. 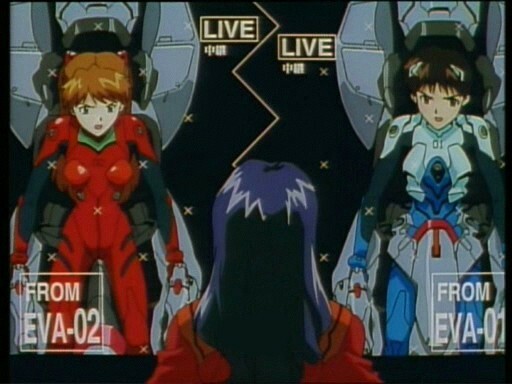 Also Rei and Asuka use the extra parts at times throughout the series. I don't beleive the "seatbelt" is restricting Shinji from running away. Yeah... Go too deep into this weird "genital symbolism" stuff and you turn into Mr. Greenfingers or the Boy Wonder. Most of that stuff is reserved for the Evas and Giant Naked Rei and, even then, it actually has a point if you think beyond the typical, rather limited Western viewpoint. "omg its teh p00ntang anno is teh p3rvert! !11"
But anyway, I haven't been following this thread (too distracted with other things), so I'll go away now. Zugzwang wrote: Do I really need to point this out? I don't get it. But looking at the image reminded me that the "seatbelt" structure extends forward from the regular structure. Perhaps there are additional controls on it. Time to look at more shots. Zugzwang wrote: What about the implied phallic symbolism? I think the phallic symbolism ends with the entry plug being inserted into the Eva.